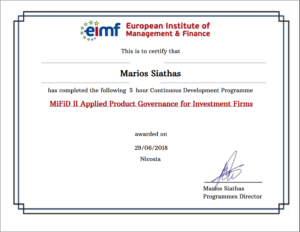 Congratulations to Marios Siathas and the European Institute of Management and Finance for being selected as the next Certificate of the Month winner! The European Institute of Management and Finance (EIMF) is a leading provider of training and continuing education courses for European Union businesses. Individuals and organizations can enhance their knowledge and skills and attain professional qualifications by attending EIMF courses. EIMF creates and distributes Certificates for individuals who complete classes. After an online search, Marios selected SimpleCert as the Certificate Management System for the EIMF. “SimpleCert offers the ability to produce professional quality Certificates that are easily accessible to individuals and organisations, thus of great benefit to our clients, “ says Marios. The primary driver that led EIMF to search for a Certificate Management Solution was not centered around improving processes – although that has proved to be a benefit with the adoption of SimpleCert. SimpleCert was introduced as a benefit for their clients, who can now easily access and view their certificates because of individual SimpleCert Recipient Portals. A SimpleCert Recipient Portal provides a convenient place for an individual to access all certificates that they have been awarded from the EIMF. EIMF certificates also provide a personal record of an individual’s training. Therefore, this is useful for both personal records as well as documentation for Continued Professional Development requirements. Congratulations again to Marios and the European Institute of Management and Finance for being selected as a Certificate of the Month winner! As a winner of the program, the EIMF has received a free month’s subscription to SimpleCert. Would you like to nominate a certificate to be included into the Certificate of the Month Program? Simply send an email to inquiries@simplecert.net, and check back in the future as more winners of the program are announced.